Infant Car Seats Safety and Shopping carts -What you NEED to know. All too often I’ve seen parents say ‘My car seat manual didn’t have anything in it about this…’ It made me stop and wonder, is this true? Are there certain types of infant car seats that are compatible with shopping carts so that you can safely place a infant car seat on the upper part of the cart? Do the manuals these parents say they are reading really not have a warning in them that tell them NOT to use their infant seats on top of carts? I’ve been pulling every manual I can find offline the last week to compile a list of infant car seats and their manufacturer recommendations for use with shopping carts. Its a list of the 2012 popular infant car seats that were sold last year into this year. I included links when I could so that you could go over the manuals yourself. There are less then 2 manuals that I could not find a specific sentence of ‘NEVER place carrier in/on top of shopping carts.’ But, there are warnings in every guide that state/warn of fall hazards. ‘Fall Hazard: Childs movement can slide carrier. NEVER place carrier near edge of counter tops, tables or other elevated surfaces.’ So it’s pretty easy to put two and two together. Infant carriers do not belong on a surface that they can FALL from. You can find the completed list here: 2012InfantCarriers (word), 2012InfantCarriers (PDF) Please look it over and see if your brand carries the warning. If you read through your manual word for word like most manuals say you should, you will sometimes find this warning in the **WARNING** section of the guides which you can locate in the table of contents or within the first few pages of your guide. Your guide may not have it in that section but it will be thrown in somewhere amongst all the information so keep a close eye on photos and those little warning symbols. 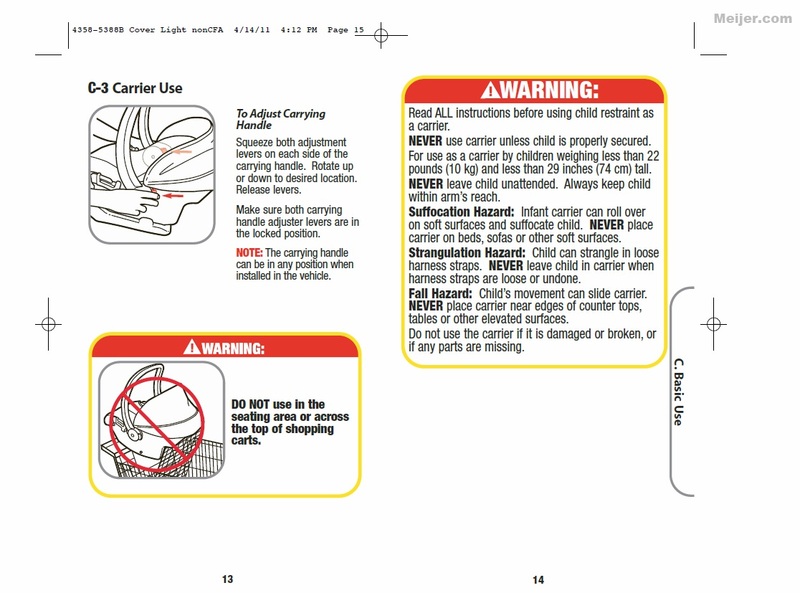 Car seat manuals are pretty generic when it comes to the companies warnings for particular products. 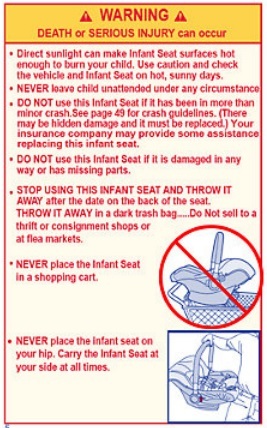 You’ll find that most companies will have different set up instructions for different model car seats but that their safety information is pretty much the same in each manual for each brand or model that company produces or sells. For example: Dorel Juvenile Group. The brands under this company are Cosco, Safety 1st, Maxi-Cosi and Quinny. All sold under their own brand name but all with different instructions. All with the same generic warnings. Well, for starters it means that car seat companies are well aware that their products are being misused and have made it known in their guides to not put your infant carriers on top of shopping carts. Once you use your carrier outside the normal use that it’s made for, you void warranty and if the product fails during an accident, you cannot sue the company for something that they basically warned you about to begin with. It’s a ‘use at your own risk’ warning that should be followed to prevent injury and death of your infant/child. The CPCS put out a bulletin in 2012 echoing the same warnings the AAP has put out there for parents. 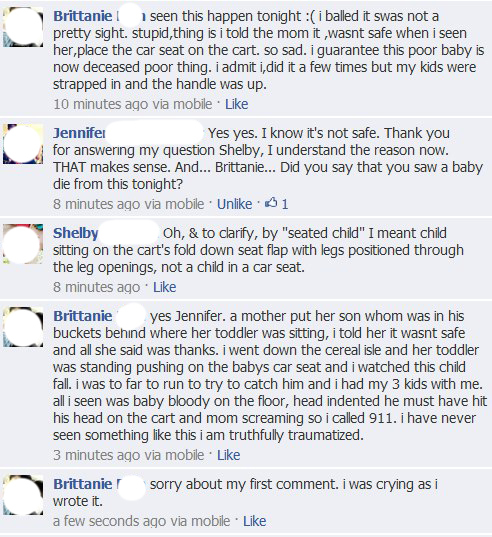 Ashlie M- I was at walmart and I had my daughters infant seat clicked into the top. The wheel was bad but I hadn’t been paying it much attention, I was only 20 years old and new to baby and new to shopping alone. Anyway I was pushing the cart when the wheel caused it to jump hard, the weight of the food in the cart made it pull to the side and it was way to heavy for me to stop. I held onto it and lead it to the ground slowly/softly (Thank God my daughters seat stayed and didn’t fall off) but my arms were sore for days and I NEVER did it again. Another infant died last year after the carrier he was in fell from the top of the cart. It was reported through a Facebook car seat safety group by a women who witness it happen AFTER she had told the mother the dangers of putting her baby and carrier on the top part of the carrier. The images here tell the story. Okay, well let’s look at the other aspect of danger. The shopping cart itself. Do you know when that cart you place your carrier on was last serviced? Do you know if the cart functions the way it is suppose to and will not fail? Probably not. Shopping carts are abused and used daily multiple times a day, 24-7, 365 days a year. Normally, stores are suppose to do a 3-6 month cleaning, check and if needed repair. But that’s not to say that their check and repair missed anything. Anna M – This didn’t involve an infant seat, but it’s a shopping cart accident, and would have been catastrophic had there been an infant seat on the cart. I was in PetSmart a few weeks ago, my 4-year-old was walking, and my 20-month-old was in the seat of the shopping cart, strapped in. My husband and I turned our backs for a second to pick out some cat litter, and in that tiny space of time, our 4-year-old got onto the side of the cart, and leaned back, pulling the cart over onto himself and ditching our 20-month-old onto the floor. They both were ok, although our youngest had a big bruise on his head, but it was very scary. This could happen to anyone with older kids and babies. Stores are also aware of the dangers that a shopping cart can pose. Again, it’s a ‘use at your own risk’ once they post warnings on their carts. More and more companies are equipping their carts with specific warnings to users. There are a few options you can explore to find out what works best for you. You can put the infant car carrier inside the shopping cart(where the food would go). Yea, I understand this contradicts the CPCS warning above, but its a much safer alternative to leaving your baby on the top part where any movement can topple them off. Your child cannot fall OUT of a cart as easy as they can fall OFF! You could leave your child at home with a spouse or friend/relative. You could have your spouse/friend/relative go shopping for you. The options are there for you to look into. The majority now days find that wearing their baby has solved the car seat safety dilemma. Well, when you take the time to look and learn, you use that information to your best ability and apply it to your everyday life. Always do your best, but remember to open yourself up to new information so that you can do better. After all, it’s our children’s safety and lives we are talking about. They deserve to have well informed parents willing to keep them safe at all costs! Please note that any and all comments are monitored. Any comments that contain threats, are harassing or otherwise not helpful, will be deleted. We respect that not everyone will agree with the postings here but we also hold the right to delete nasty comments. 68 Responses to Infant Car Seats Safety and Shopping carts -What you NEED to know. Thank you for this very informative blog post! Until I had my daughter, I always assumed putting your infant carrier on your shopping cart was the right thing to do. However, at my very first shopping trip with her, it felt so wrong that I had my father push the cart and carried her instead. Shortly after I began reading about these infant death/injury horror stories. I am so glad I listened to my intuition! My daughter always rides in the ergo while I shop. I think that it is a good idea to suggest baby wearing when educating mamas after the dangers of clipping baby to the shopping cart – it SO much safer, keeps your hands free, and even frees up space in your cart. This is important information. My husband and I are wheelchair users…It’s not an option for us to carry infant car seats. We found other ways with our daughter (who is now 2.5 years). I’m still amazed by the number of people that were completely befuddled that we could be parents if we couldn’t carry her seat…There are other ways but people seem to forget that! Yes you may have to move them when they are sleeping but babies are not intended to be in these seats for extremely long periods anyways…..As for us, we are creative, use other methods, and often have to really plan ahead/arrange our schedules so that we can do most of our shopping without our daughter. I’m so glad I read this. There are times when I’m in such a hurry that I don’t make good choices. This is a good reminder. Thanks for all your research. Hopefully we can save some infant lives by spreading the word! I wish there was more information on those car seats that you CAN remove from the car, as far as if it is even safe to always be taking it IN and OUT of the car?! I am debating getting one of the infant car seats that you can remove (snap in/out) VS. just getting an all in one grow with the child permanent car seats. It would make sense, the more you mess with the car seat, the less safe it becomes. This post was helpful, although very sad that people still would do this! This video was the kicker. Another option when people ask what they are supposed to do with their baby when shopping – I clip my child’s car seat into her stroller as it’s meant to be used, and then use the basket underneath the stroller for my groceries. When I get to the check out, I just place the groceries on the belt just as I would from a cart. That is a good option. Thank you for sharing! Just remember to clean basket because bacteria from fresh food and meat especially,and other things could get on baby blankets and such that baby may touch. As the narrator had expressed information regarding the Child car seat through which we could gather several advantageous features about the product which could help the child in growing up and coming aware about some unique things to play. Pingback: Life, Love, and Dirty Diapers » Do You Say Something? Thank you for all of the information. I always put my son in the large basket part of the shopping cart. It can be an inconvenience but is totally worth it to keep him safe, as your information reminds me. 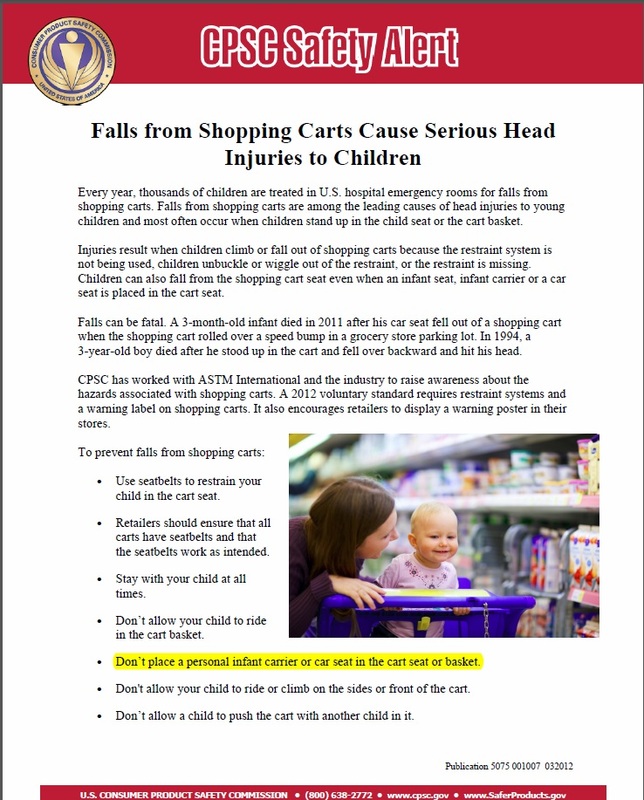 Did you notice on the CPSC warning it says not to put the car seat in the basket of the cart either. Do you know any incidences where a child was injured while in a car seat in the basket? I haven’t heard of any injuries personally where the car seat was in the basket. I can see it happening if a child is hanging on the side and throws the cart off balance in turn tipping it. That’s happened. But Im not sure if any infant seats were involved in those incidents. I was wondering the same thing. If the cart can tip, does putting them in the basket protect them? Also, if the fear is that the front seat can collapse and the cart can easily tip, is it even safe for my 20 month old that sits in the front? I’m not arguing that putting the infant seat is safe, but rather wondering if we should use the front seat for any age child if those are the reasons. Thanks for the info, I really appreciated this article. That is exactly what I am wondering at this point. If the seat can collapse like that, then I see the same thing happening as a a baby being in the car seat. Imagine something like that happening, the legs would get stuck, etc. and the child would be in a horrible situation there! I like the carts with two solid plastic seats added on- Target, Walmart, and Publix all have them here. Really?! I didn’t realize that! Won’t be doing that ever again. 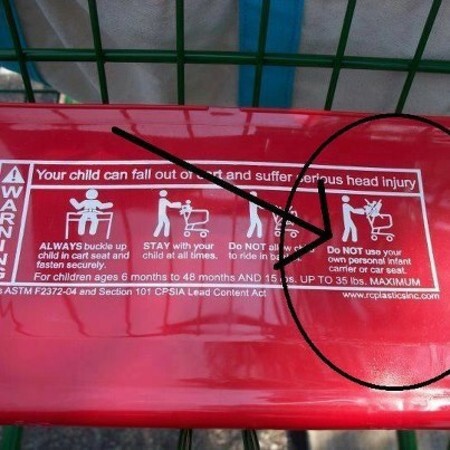 The warning refers to children 6 months and older who can stand and off set the balance of the cart. Hi Sally, thank you for your comment. I will collaborate with some technicians and get some feedback on your comment. From my personal understanding, and I could be wrong, I believe the CPSC warning is aimed at keeping car seats off the top portion and keeping infants and toddlers 6-48 months out of the basket so that they don’t stand and tip the cart. Thank you so much for this post. I always put my baby’s capsule inside the trolley, if I have to use one (or I just hold her capsule in one hand and a basket in the other), but I have seen other mothers doing this. That video made my heart stop. What a sickening thought! Never let your child ride in the seat on the cart when going to your vehicle. I saw a van back into a cart that a child was riding in. You can’t get the child out of the seat fast enough. The cart tipped over with the child in it. Everyone was ok but it was scary!! My little one got his foot stuck in the bars of the shopping cart. I didn’t notice until checking out and couldn’t get it out. A sales associate got baby oil and poured it all over his foot and ankle. He was only 9 or 10 months old and I didn’t have shoes on him. Learned my lesson shoes and shopping cart cover are used now. It says not to allow children to ride in the basket, which I am pretty sure if referring to older toddlers, who can flip out of the basket, not an infant in a car seat. Ah- now I see where it says that about the infant carrier too. Very strange…..
Ive been working on a print out you can keep with you in your purse to hand to parents. Its a more non confrontational approach and they can look at the information when they are ready. Ill post it when its complete and announce it on my facebook page. Our cars eats had latches that hooked and locked onto the cart you had to undo it just like in the car by pulling and hiding the safety latch while pulling up on it , there was no way it could fall off the cart ! It literally hooked and closed around the bars locking in ???? Those latches were really to lock it into the base, and I have read that using it for other purposes can damage that mechanism. Even if the seat does stay attached, it still makes the buddy top heavy, and there can still be some serious injuries from a fall that high, even if they remain attached to the buggy. I thought so too, but that’s not the case (see my story below). The car seat I had for my first child actually clicked into the top part of the shopping cart. I’m pretty sure it clipped into the base for the car seat too and that’s what the hooks were really for. But that was 5 years ago. We had a carseat/shopping cart incident that could have killed my daughter when she was an infant. The carseat clicked into the top part, so I thought she was safe. Thank God I left her buckled and left the handle bar up. It was dark and raining and on the way out of the store, one of the front wheels of the cart fell into a crack in the cement. The entire cart fell forward and the carseat flipped over backwards. It flew far enough to land a few feet away from the cart on the cement and rolled with my baby in it. A little old couple helped me gather my things while I got to the baby to check her. She was okay, and I got everyone into the car; then I broke down and sobbed in front of my kids. I didn’t even know that it didn’t click in all the way. The click only prevented it from falling forward. I am so lucky and so grateful! Please do not put your carseat in the top part of the shopping cart! Im glad your daughter was okay! That is a very scary and frightening life lesson to experience! Sorry but how do you shop? Not going to pawn my kids off to others so I can grocery shop. Maybe they need to make better carts? I have raised two children and put their infant seats in the top part. Never once had a problem or even thought it would tip. Handle was always up and seat was locked in. I use a baby carrier. Its not an option for others but this is the safest option that has worked for many. As stated, car seats do not lock onto carts. Its a false sense of security to hear it click in. The locking mechanisim can also be damaged making the car seat unsafe if not used properly. You do not need to ‘pawn your kids off’. These are merely suggestions. Find the safest route for you and your child. Thank you for your comment. I agree with Shell. At what point do we let freak accidents and fear take over our lives? I’ve read the comments above and if someone stopped me in a store to tell me that I shouldn’t have my baby in a cart or hand me a flier, I’d be seriously annoyed. Pay attention, don’t leave your baby, and do what you can, but trying to adjust your life to eliminate every possible freak accident is unrealistic and impractical. If you can prevent something like this, since it IS in your control, do it. Or dont. Your choice. A child’s life is worth far more then being annoyed with a stranger concerned for the safety of your child. It takes a village. So basically there is no safe way to use a cart with a child. Even a child put in the cart seat correctly can be injured if the cart tips. This information is useful and will make me more cautious, but I don’t plan to stop using a carseat with a cart. My baby did not like baby wearing, and I wasn’t going to strap her to me for an hour of crying. I also am not going to become too paranoid to take her shopping with me, and there is no way I could fit all of my groceries in her stroller. My point is not that I want my child to fall and be injured. My point is that information is good, but parents need to do what works for them. The last thing I needed as a flustered new mom was to think everyone around me was asking themselves how I could possibly put my child in danger. Maybe I ask myself that when I see other kids allowed to jump on trampolines or play in the front yard or ride bikes, etc. Living poses dangers. Kids cannot and should not be bubble wrapped. Parents need to take steps to keep their kids safe as they feel appropriate, but a culture of judgemental criticism toward people who parent differently is unhealthy. 110% agree! For the love of god, do not shame a mother doing this! Hopefully no one shames anyone, but instead educates on the dangers of placing an infant in a car seat on the top of carts. The goal is to inform. Im sorry that you feel information is fear-mongering. Thank you for your comment. The bottom line here ladies is that you need to use your best discretion that keeps your child safe and works for you. The article is meant for informational purposes only and points out some critical concerns that many may not think about. You are welcome to do what you feel is best for your situations since we come from all different walks of life. Thank you all for your comments. You’ve raised some questions I need to ponder on and will get back to this when I have answers. But I have seen baby carrier designs with a slot in the bottom so it can straddle the back of a shopping cart seat. Are you saying this is unsafe? Those do not budge. You would have to look in the car seat manual to determine if it is warned against using it on top of a cart. Almost all infant car seat manufactures warn against use on top of carts and none are made with special slots for fitting onto carts. The slots are for the base. If you can get me the name and make of the carriers you are talking about, I can look into it. over cart wire (fig. a). I believe those are the only two seats to say anything about cart uses. But they contradict their instructions when they say to keep the infant seat off elevated surfaces. I have a Baby Trend. Out of all the store carts I tried to ‘lock’ it into just to see, 0 success. Have you guys not got the trolleys over there with built in capsules in them? In Australia there are several types of trolleys you can get at most places: Capsule, toddler seat, double capsule or toddler seat and one of each. We don’t have anything as of yet that Ive seen. But Ive heard that a few places have a cart that the seat can be strapped onto. Im still researching it. Wal mart in Washington, Bi-mart and somewhere else I went had built on infant carriers like our Australian friend asked about. Unfortunately they only had a few at the bigger stores, so you might have more babies on a busy day than carts, but it is a step in the right way! I know this post isn’t new but I wanted to say something. 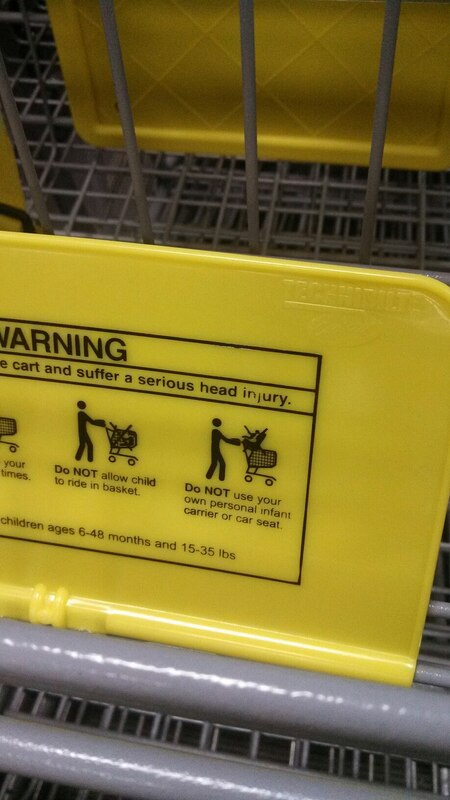 My son has a head injury caused by a shopping cart incident. His seat was “clicked” onto the cart. The wheel went into a hole in sidewalk. The cart tipped on its side and the seat went flying. It rolled violently 3 1/2 times before stopping on its side in the middle of the parking lot. My then 9 week old son was lucky to survive. They told me at the emergency room that I saved his life by having his straps as tight as they were. He will never be “normal” but he’s alive. I don’t really care if you don’t want to hear our story. If we can save one baby then it’s worth it! Yeah, I agree. There is too much information there. There are a million ways your baby could die. Babies doe from SIDS at home in cribs (no bumpers, room the perfect emp, etc., etc.) Accidents happen. You cannot prevent every accident. These types of posts are just too much. As someone who suffered from a case of post-partum anxiety, I am sick to death of the fear mongering. I was so metally ill because of all of these public service announcements that I became the danger to my kids that I was so afraid of. I became so exhausted due to the anxiety that I began having panic attacks. People who write things like this to blast all over the internet should be aware of what they’re doing to others. It isn’t helpful. It’s only creating unstable, paranoid mothers. You should be ashamed of yourself! We mothers have to do the best we can without judgement. At the very least, you could earn us that there is a trigger in this post. For Pete’s sake, someone who is knowledgeable on parenting should know that! I found the article interesting and I actually didn’t know some of the things that were discusses in it. In case you haven’t been told, you do realize no one holds a gun to your head and tells you to go read these articles right? That its YOUR choice to click the link and read them? Do not blame others for your lack of common sense and problems. This article isn’t about SIDS deaths, or other accidental deaths. Car seat deaths can be prevented by using them properly. Im sorry you suffer from post-partum anxiety. I too went through that and stayed away from mommy blogs for the longest time because I was overwhelmed by the information given. Everyone has that choice. I hold no shame in educating parents. Regardless of what the topic is. You cannot fight facts and you cannot avoid them. This is something that completely preventable though. I lost my first two kids, and now have a living son, this is not a thing of fear mongering it’s an informative piece to prevent more deaths that CAN be prevented. We couldn’t do anything in the case of our children, but you are asking for it if you put your child in a shopping cart like this. It’s totally preventable. I guess I was lucky. I did this every time I went shopping since I had twin babies. One would go in the top of the cart and the other would go in the basket part of the cart. I had no other options for grocery shopping. Family isn’t close by and my husband was in Afghanistan during their infant months. My car seats fit snuggly in the top of the cart with a piece that locked in place which made the car seat hard for me to detach so I always felt like they were safe. Definitely wouldn’t do anything that I didn’t think was safe. Just glad that mine are toddlers now and that this isn’t an issue for me anymore. Pingback: Grocery Shopping with Twins and More - How Do You Do It? I have a question. I saw a “mom” put the seat in sideways on the cart near the back still on top but it was sideways I don’t know if this makes any sense at all, but is this safe? I’m not so sure it is. And this baby looked to be just a couple weeks old, the older “sister”, I guess, was showing the “mom” I can only assume it was the mom since I don’t really know. I was just thinking to myself when I saw it that there’s no way that could be safe. I could always ask for a store staff to help me out. I have 4 kids, including 2 that need to sit in the cart, and if I ever find myself in a difficult situation at the grocery store, the staff are always friendly and eager to help me out. They have often offered to get a second cart for me, especially when I have a baby carrier inside the basket and a toddler in the cart seat and no room for the actual groceries. Or if I have an infant that’s fussy and so I’m walking around with them in my arms as I shop. Point is, if you prefer to carry your child yourself, or even push them in a stroller, or need any kind of added help at all, the staff will be there for you. While they may not have enough staff to do this for EVERY mother with an infant, if this is something that’s important to you, they’ll be happy to oblige you. They always seem like they enjoy actually helping a customer (rather than merely checking them out or stocking shelves, etc).